I can’t say enough how thankful I am that we chose to go with Creative Destination Events to coordinate my daughter’s destination wedding. We were fortunate enough to make a planning trip to Cabo 5 months before the wedding. We had previously only been dealing with our on-site resort wedding planners. We met Suzanne when she came to our resort for us to choose linens. I soon sensed that she was a go-getter with a sense of understanding of what we were envisioning. We wanted final say in all decisions but needed leadership through the process. Suzanne took us to her warehouse to see their many options in linens, dishes, furniture, etc. As I watched her team assemble, take down, and reassemble different set ups and table scenes for us, I could clearly see this was a well run, team effort, group that could figure out our vision and bring it to life. After realizing that through Suzanne’s businesses they could handle not only the linens, but every aspect of a wedding – flowers, linens, tables and chairs, furniture, hair and makeup, music, design, set up, and take down, we hired them as an outside wedding coordinator. We were assigned a coordinator- Melissa, and a designer-Tere. They were AMAZING! We made many wedding related decisions that day in their warehouse but still had a lot of details to work out as the weeks went on. I like (expect) reasonably fast and specific communication when working on any project. They were always available through email or phone calls to answer questions or make suggestions. Every few weeks we would have a conference call (Melissa, Tere, Suzanne, my daughter and myself) to make sure everyone was on the same page and discuss any changes or decisions that needed to be made. Tere and Melissa would send us updated visions, floor plans and timelines as things progressed. Once we arrived back in Cabo, wedding week, we were taken back to their warehouse where mock-ups of our tables had been assembled, and final floor plans and timelines were established. We were shown custom signs and other items that we had picked out online. We made a few very small tweaks and were told to go to back to our resort, relax and enjoy the next few days as they had everything under control. And they did!! The days leading up to the wedding and the day of were absolutely stress free for the MOB and the bride. I didn’t know that was possible!! We spent the wedding day in the brides room, with the awesome hair and make up team working on 7 of us, drinking mimosas, snacking, listening to music, laughing and chilling. We got updates and pictures of the setup from Tere and Melissa and a few of our wedding guest that would stop by the bridal suite for a quick visit. It came together perfectly!! The wedding was a legal ceremony and held on the beach. The cocktail hour, dinner and reception were on a terrace overlooking the beach. Their team moved the chairs and flowers from the ceremony to the terrace seamlessly as we made pictures and mingled with our 60+ guest. Melissa kept things flowing on schedule from the beginning of the day till the end of the night. 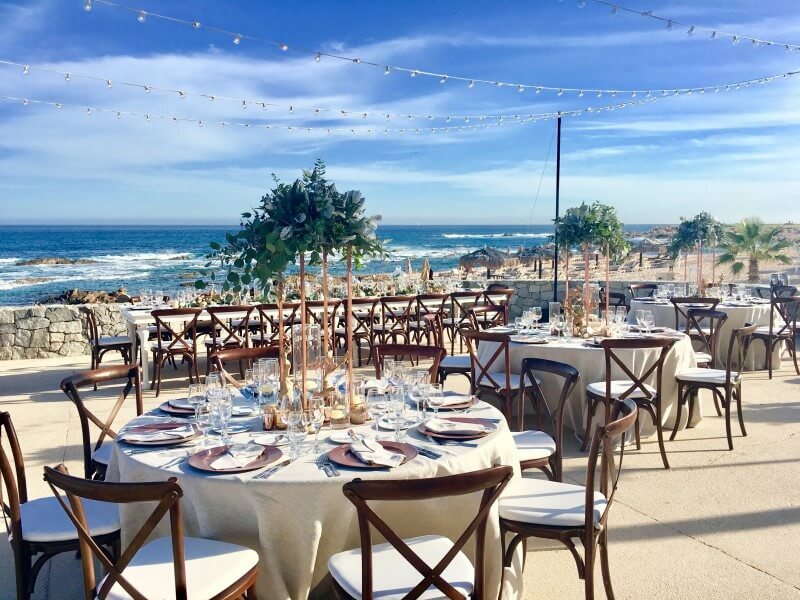 The natural beauty of Cabo along with the creativity, attention to detail, and professionalism of the team at Creative Destination Events make the perfect combination for a wonderful, stress free destination wedding. My daughter has said it was the wedding of her dreams and I think that is the ultimate goal for all mothers of the brides. This entry was posted in Cabo Linens Things and More, Testimonials and tagged Grand Fiesta Americana.